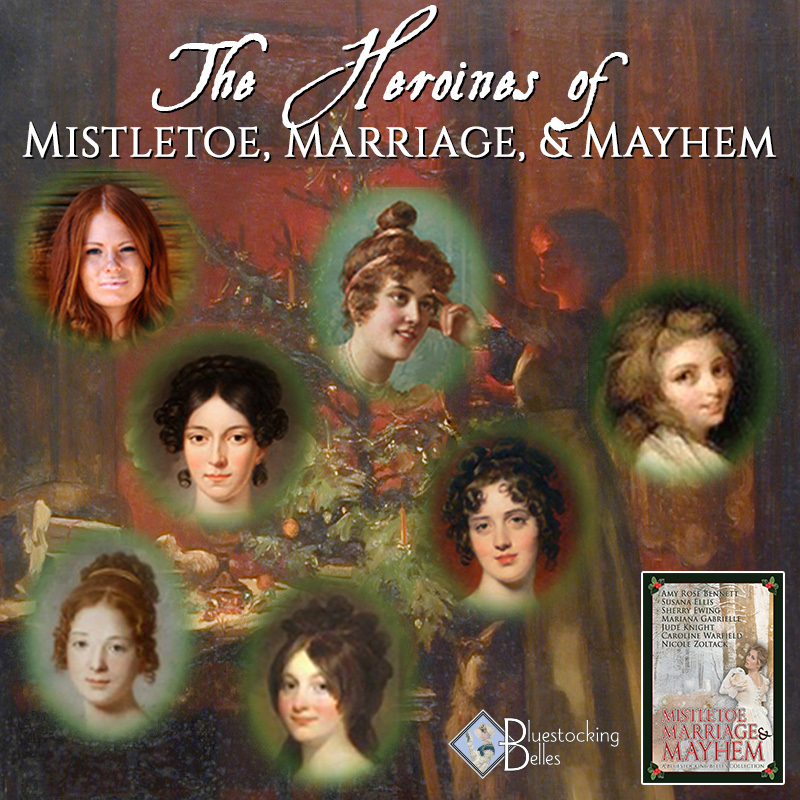 With the holidays upon us, the time seemed right to sit down with Catherine Wheatly whose story recently reached its happy ending in “A Dangerous Nativity,” one of seven stories in Mistletoe, Marriage, and Mayhem, a Bluestocking Belles collection. 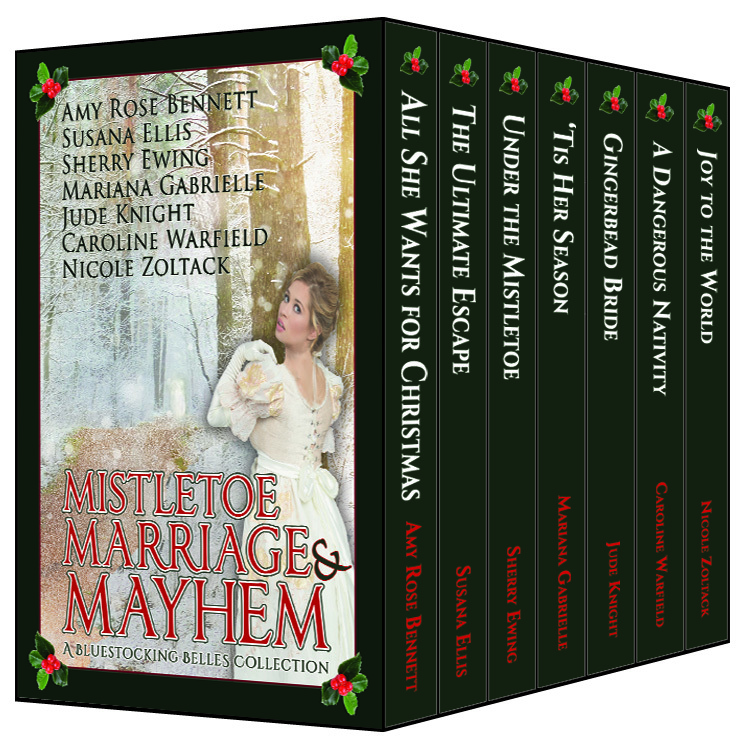 The author and Catherine sip warm cider in front of an energetic fire under a mantle festooned with greenery and ribbons. Caroline: This turned out to be a momentous holiday season for you. A wistful look comes over Catherine’s face and she smiles a private smile. Catherine: The most momentous of my life. I am overwhelmed by love from all sides. I have a fiancé, a brother I never knew existed, and I’m closer to Papa than ever. Caroline: But the man you call “Papa” isn’t your actual father. Catherine: He certainly is! I won’t abide anyone saying otherwise. The man who brought about my conception was no father in any meaningful way. Still, I admit I am glad to have the information. I always knew my birth was irregular. At least now I have the facts. Caroline: Still, you tried to run from the Earl of Chadbourn when he proposed. Catherine: He rather rushed it under the mistletoe, didn’t he? Caroline: That wasn’t all of it though, was it? Catherine: No. I confess. A base-born spinster hardly brings any credit to a man of Will’s position. I bring no dowry to speak of. I reminded him that I’m not even eligible to be presented. Do you know how he replied? He laughed! He told me that as his wife I will be eligible to be presented to the queen and have entrée to any gathering or home in the United Kingdom. Caroline: Is that why you decided to accept him. Another memory makes her smile shine. Catherine: No. He finally asked how I felt about marrying a farmer. He claims to be a finer farmer than earl. That is nonsense of course, but I realized the title is superficial. At heart he’s a man who values family, cares for those dependent on him, and has a passion for the land. Those are all values we share, and they’ll give us a good foundation for marriage. Caroline: When will you marry? Quickly? Catherine: I wanted quickly and quietly, but Will will have none of it. He says that my very insecurities are the reason we need to let his sister the duchess host a large society wedding. Everyone, he says, who is anyone will be there. Caroline: Goodness! Good luck with that. 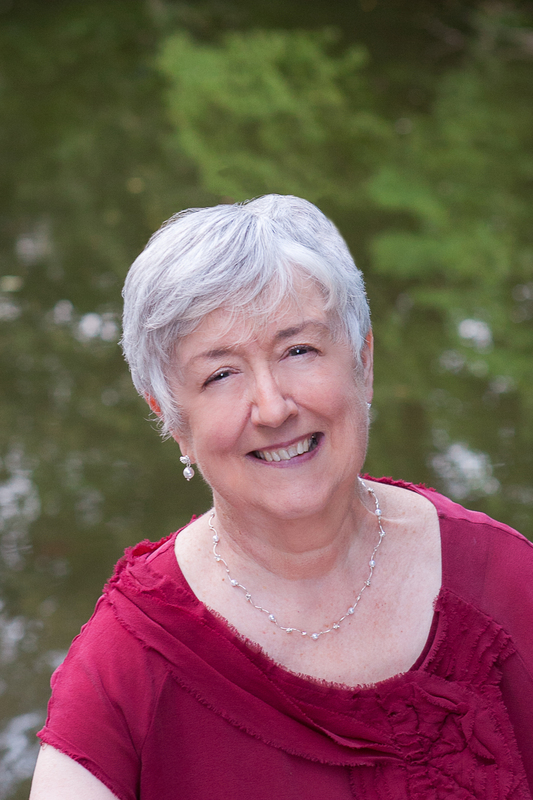 The author smiles. That wedding has already been written into Dangerous Works. The Earl of Chadbourn he loves nothing better than to care for his fields, his flocks, and the people who earn their living from the land. Trapped by his brother-in-law’s death into responsibility for his traumatized nephew, grieving sister, and an estate gone to ruin, loneliness overwhelms him. The first-rate husbandry of a neighboring farm and the woman who runs it draw him like a moth to flame. With Christmas coming, can he repair the damaged estate and far more damaged family? Dare he hope for love in the bargain? Currently retired to the urban wilds of Eastern Pennsylvania, she sits in front of a keyboard at a desk surrounded by windows, looks out at the trees and imagines. Her greatest joy is when one of those imaginings comes to life on the page and in the imagination of her readers.